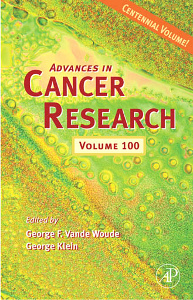 The Advances in Cancer Research series provides invaluable information on the exciting and fast-moving field of cancer research. This volume presents outstanding and original reviews on a variety of topics including RUNX Genes in Development and Cancer; The RNA Continent; The c-myc Promoter; Designer Self-Assembling Peptide Nanofiber Scaffolds for Study of 3-D Cell Biology and Beyond; and Dendritic Cells in Cancer Immunotherapy. Researchers and students in the basic and clinical science of cancer biology and oncology, plus related areas in genetics, immunology, pharmacology, cell biology and molecular biology.